Dear J - Where has time gone? I've been busying myself with all sorts of backlogged house-related projects. The morning of this meal, I was at an upholstery shop selecting fabric for the antique sette, a project I've wanted to do myself for a decade. A kind coworkerfriend helped me and sent it off to professionals. I don't know if my cloudy sad mood affected this dish, but it seem to lack ... something. Or perhaps nothing feel quite right. 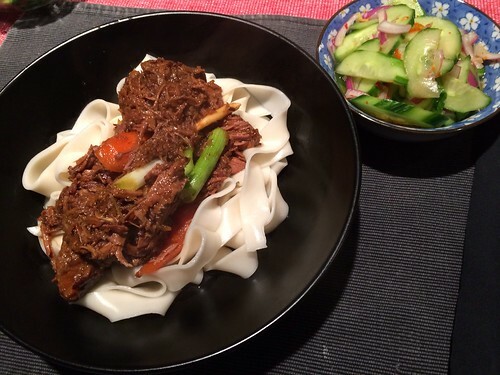 It is a braised beef with rice noodle recipe from Bon Appétit. I seared the beef, then stir fried lemongrass, ginger, garlic, together and braised for a few hours on Friday. On Saturday, I reheated it when I came home, then added carrots and green onions. It was ok. I made a cucumber salad to go with the braise. 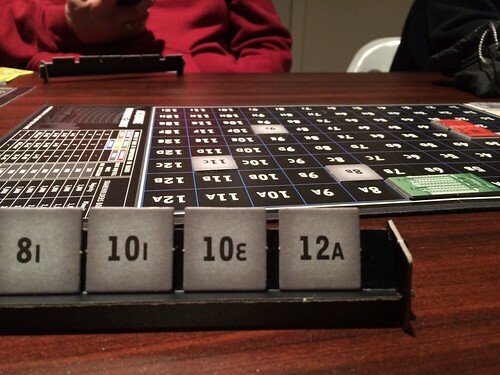 After dinner, we played Acquire and argued, as per usual, about the rules. I was too mentally tired to partake. Ah. I also spy the wonderful temporary table in the picture. Another side effect of the mad house projects. I apologize for the furniture situation and hope you don't mind the plastic chairs too much.